STAYCEE PEARL dance project & Soy Sos :: sym. 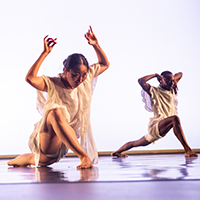 Live experimental music and stunning visuals set the scene for sym, a deeply atmospheric dance and sound experience inspired by “Fledgeling,” a novel by African American Sci-Fi writer Octavia Butler. In collaboration with acclaimed Visual Artist Barbara Weissberger and Musicians Sadie Powers & Bonnie Jones, STAYCEE PEARL dance project & Soy Sos explore Butler’s mysterious universe of vampires and humans to examine symbiosis, gender identity and race as it relates to contemporary culture. sym was commissioned by the Kelly-Strayhorn Theater, and made possible by the generous support of The National Endowments for the Arts, The Pittsburgh Foundation, The Heinz Endowments, Opportunity Fund, & the Lift Grant. Pay What Makes You Happy! Tickets for this event are available at any price. Simply choose the level that makes you happy—or name your own! All seats are general admission. Copyright © 2019 Kelly Strayhorn Theater.